Aparna Yadav, the daughter-in-law of Samajwadi Party chief’s Mulayam Singh Yadav has fallen into trouble. She is on target for dancing to ‘Ghoomar’ song from Deepika Padukone’s Padmavati. Sanjay Leela Bhansali‘s Padmavati starring Deepika Padukone, Ranveer Singh and Shahid Kapoor has fallen into trouble since its shooting started. The Karni Sena claim that the film “distorts” historical facts. However, the makers have repeatedly assured that there is no such scene in the film that will harm the sentiments of the Rajput community. The protest around the film turned ugly after Rajput groups and political parties made violent threats against Deepika Padukone. Rs 10 crore was announced for anyone beheading Deepika and SLB. If that was not enough, political parties started intervening in the matter. The film is banned in a couple of states in the country. Read here To Know More: After Madhya Pradesh And Punjab, Padmavati To Be Ban In Maharashtra? Well, the controversy around the film is getting intense with each passing day. 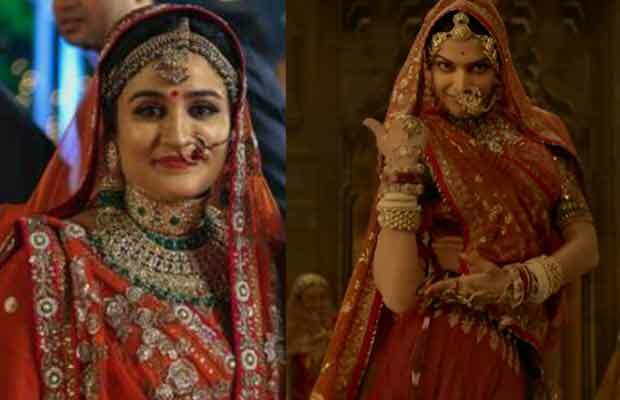 Aparna Yadav, daughter-in-law of Mulayam Singh Yadav, has fallen into trouble for dancing to ‘Ghoomar’ song. Aparna recently performed a dance on the song at her younger brother Aman Singh Bisht’s engagement. After Deepika, Aparna Yadav is the target of fringe elements. A video has gone viral on social media. Aparna Yadav is dancing to ‘Ghoomar’ song along with a group of women on stage at the family function. Karni Sena, an organisation of the Rajput community, is particularly miffed at the bahu of the political leader. The Karni Sena Community claims that it is not a right depiction of the past. “It is sad that a prominent political family’s member has chosen to behave in such a fashion. It is as if she is trying to tease us and rub salt in our wounds,” a leader of the Shree Rajput Karni Sena said while talking to Times Now. ‘Padmavati’ was earlier releasing on December 1. However, makers mutually decided to postpone the film due to controversy. Previous articleShubhangi Atre Reacts On The Reports Of Her Quitting The Serial Bhabi Ji Ghar Par Hai! Next articleRanbir Kapoor Meets A Mystery Girl While Mahira Khan Reveals Plans For Second Marriage!